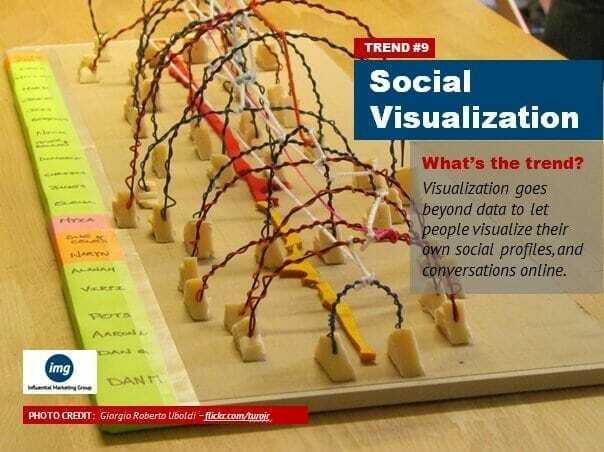 Visualization goes beyond data to let people visualize their own social profiles, and conversations online. For more than a year, data visualization has been a big trend in the social media space (it was among my top 15 trends for my 2011 Trend Report!) Now this love affair with visualization is extending to our own personal profiles as we seek out new ways to express ourselves in more visual formats. As new platforms come out to interact with musicians in new ways and share our professional legacies with the world, the sites that don’t offer as visual experiences stick to just cranking out data based infographics will seem so … 2011. Anyone working in a marketing, communications or social media role will likely encounter this trend on multiple sites and even in their daily work. In addition, if you are building your personal brand or professional profile online through content creation and trying to build an audience for your thinking online, this will be an important trend to consider.